Shelburne Golf and Country Club’s Junior Program was recognized as Ontario’s best in 2011. Learn the game you can play your whole life, the game that promotes a healthy lifestyle in a non-violent environment. The Junior and Junior-Junior Membership Programs include weekly lessons with nationally recognized Golf Ontario Hall of Fame Member, CPGA Professional, Sam Young. The program is divided into three sections; Junior-Junior for 6 to 9 year olds, Junior for 10 to 18 year olds and Advanced Juniors who wish to make golf their primary summer sport. Shelburne Advanced Juniors have won five Provincial Championships in the past seven years and have had a significant number of high finishes during that time. Junior Juniors receive a one hour group lesson per week Saturdays from 3:30 to 4:30 from may 5th to June 23rd. Junior Juniors receive a one hour group lesson per week Mondays from 4:30 to 5:30 OR Saturdays from 1:30 to 2:30 (choose one)beginning the first week of May through to the third week of August. The program also includes on-course supervised play, mentoring days with our Advanced Juniors and unlimited play on our three-hole course. The club also offers an award-winning golf club lease program which includes a quality set of appropriately sized golf clubs and a golf bag with stand. As well, when the Junior-Junior is ready and able to play the regular course he/she may do so every weekend after 4:30 pm as long as he/she is accompanied by an adult member or green fee paying adult. This program follows a similar lesson schedule as the Junior-Juniors: A one hour group lesson per week Mondays from 5:30 to 6:30 OR Saturdays from 2:30 to 3:30 (choose one) beginning the first week of May through to the third week of August. Juniors have playing privileges seven days a week with the following limitations: play is restricted Wednesday afternoons from 2 pm to 6 pm due to Men’s Afternoon/Evening competition, and not before 2:00 pm on Saturday, Sunday and Holidays. However, Juniors may play as standbys between 12 and 2 meaning if there is an available tee-time and the junior is ready on-deck, they may play. Shelburne Golf and Country Club provides an all-encompassing approach to the game of golf. 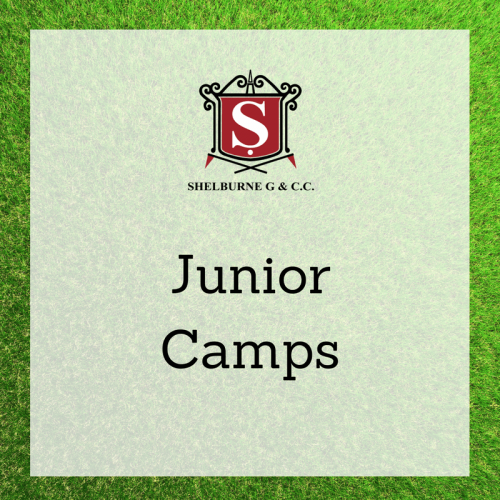 Shelburne Juniors learn not only the proper golf swing but also golf management, the etiquette of the game, the psychological approach, and health and nutrition for best performance. Advanced Juniors are graduates of the Junior Program who have the desire to play golf at the highest level. Golf is their primary summer sport. The Advanced Juniors will practice every Tuesday and Friday afternoon from 5:00 to 6:30pm rain or shine (with the new Pavilion). Advanced Juniors members have unrestricted Intermediate Membership playing privileges as well as unlimited range ball privileges at the Junior Range at the east end of the practice facility. Advanced Bantam (age 12 and 13) and Advanced Minor Bantam (age 11 and under) players have regular Advanced Junior privileges and unlimited range ball privileges at the North East end of the range. The Advanced Juniors comprise the Pepsi Titleist Team and play in all Provincial Championships. The Advanced Juniors extend their season with a winter indoor program and a March Break trip to Pinehurst, North Carolina.